I’ve always been a huge fan of Wes Anderson. Although his fans have something of a reputation of being whimsical hipsters, I don’t fit that description one iota. But I’ve grown up watching his films and I’ve loved every single one. He’ll always have his haters – my sister, for example, always moans that he is “quirky for the sake of it”. But for those who, for lack of a better word, ‘understand’ his style, he’ll always have an appreciative audience. In 2009, he entered the world of stop-motion animation with the brilliant Fantastic Mr. Fox and his work found a new audience – children. 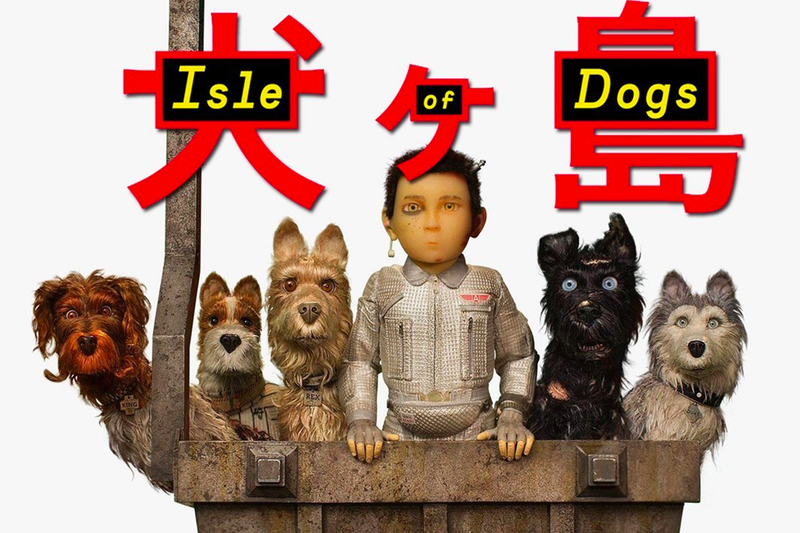 Now, almost 10 years later, he’s done it again with Isle of Dogs. So, what’s it all about? An executive decree is struck, resulting in all the canine pets of Megasaki City exiled to a vast garbage-dump called Trash Island – or, the eponymous Isle of Dogs. 12-year-old Atari sets off alone in a miniature Junior-Turbo Prop and flies across the river in search of his bodyguard-dog, Spots. There, with the assistance of a pack of newly-found mongrel friends (voiced by Bryan Cranston, Edward Norton, Bill Murray, Jeff Goldblum and more), he begins an epic journey that will decide the fate and future of the entire Prefecture. It’s certainly one of the most original premises of recent years, right? Written by Anderson himself, this is the work of a true genius. Because while it might seem silly on the surface, this is a very deep allegory for many themes. I’m reminded of Disney’s Zootropolis/Zootopia, a film that looked on the surface to be a film about a bunny police officer but transpired to be a deep study of race and corruption. Isle of Dogs handles similar themes. But not only is Isle of Dogs interesting below the surface, there’s interesting discussion to be had about the film’s above-surface too. But before we get into that, let’s discuss the elephant in the room. Some critics have been quick to argue that Isle of Dogs is a perfect example of racial stereotyping and cultural appropriation, using Japan as an aesthetic and not much else. Writing for Buzzfeed, Alison Willmore found that the film was marked by “a hodgepodge of references that an American like Anderson might cough up if pressed to free associate about Japan – taiko drummers, anime, Hokusai, sumo, kabuki, haiku, cherry blossoms and a mushroom cloud”. I get it, it does seem that way – but I don’t think Wes Anderson would do something like this without the utmost respect for the culture he is portraying in the film. Much like Disney’s Coco, this is a loving homage to a culture – not appropriation. However, I do agree with the criticism that one of the film’s characters aligns with the trope of a “white saviour”. A shame really that a white American character had to have a hand in saving the day, but there you go. Still, Isle of Dogs is a delightful little film. The voice acting across the board is utterly sublime, with a who’s who of Oscar nominees and winners providing the sounds of these wonderful characters. The visuals are thoroughly stunning throughout – this is a living, breathing world filled with hidden jokes and references, lovingly and beautifully animated. I was in absolute awe of the aesthetic of this stunning little film and hell, I loved it. I agree the white saviour is an issue. But I don’t think there’s any malice to the so-called cultural appropriation, the film really feels like a respectful love letter to a culture and a people. Either way, Isle of Dogs is a visually stunning, lovingly crafted and star-studded little adventure that deserves your time.